The future of jet operations at London City (LCY) has been secured with the imminent arrival of Embraer 170 and 190 jets. These brand new craft from Brazilian manufacturer Embraer will enter service with BA City Flyer (BA’s LCY-based division) next October. They will gradually replace BA’s existing BAe146 jets which operate both domestic and European services from LCY. The four-engined BAe146 is the mainstay of jet operations at LCY. It is one of a handful of jets which can cope with LCY’s short runway and restricted approach paths. The E170 has already been approved to operate into and out of LCY. Its larger E190 sister (which has a longer fuselage is this week undergoing “type approval” at LCY). Both craft are twin-engined and so are quieter and burn less fuel. “Passengers will find the cabin noise level midway between an Airbus A320 and a B737,” Luiz Sergio Chiessi, Embraer’s VP for market intelligence, told Business Traveller. The E170/E190s were designed from the outset to operate out of LCY. They can cope with all existing routes from LCY which means that, with a full payload, these craft could reach Oslo or Stockholm in the north, Warsaw or Vienna in the east or Rome or Madrid in the south. 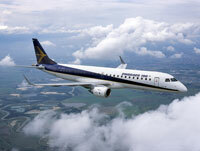 Embraer has sold many hundreds of the E170/E190s to 51 airlines in 34 countries. Here in Europe, BA is a customer (it has ordered 11) along with Air France, KLM and Lufthansa. Along with BA, the three latter carriers are all users of LCY. Depending on the configuration the E170/E190s can seat between 70 and 122 passengers in a four across (2-2) layout. Peter Simpson, MD of BA City Flyer, says that its Embraers will accommodate 76 passengers for the E170 version with the longer E190 seating 98. 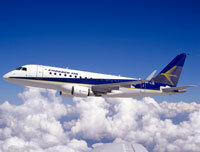 Flights will be operated in a regular Club Europe and economy class layout with a moveable curtain. BA’s initial Embrear routes from LCY are expected to be Edinburgh and Amsterdam. For more information visit embraer.com, londoncityairport.com.